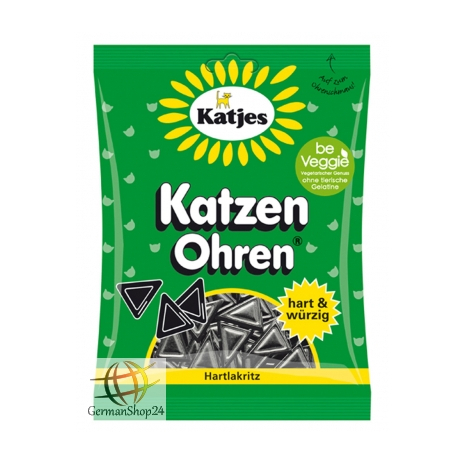 Katjes cat ears are delicious hard licorice with lots of spicy herbs and without animal gelatin! 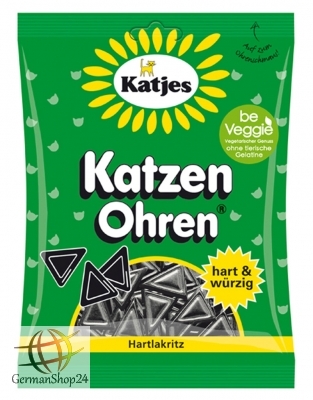 So veggie, so good! Without gluten, gelatin, lactose and without apple juice or apple pulp. Modified starch, sugar, brown sugar syrup, glucose syrup, 7% licorice juice, flavors, vegetable oil (sunflower), glazing agents: beeswax white and yellow. Modifizierte Stärke, Zucker, brauner Zuckersirup, Glukosesirup, 7% Süßholzsaft, Aromen, pflanzliches Öl (Sonnenblume), Überzugsmittel: Bienenwachs weiß und gelb.